"Honey-Can-Do SHF-01458 2-Cube Organizer, Weathered Teak. 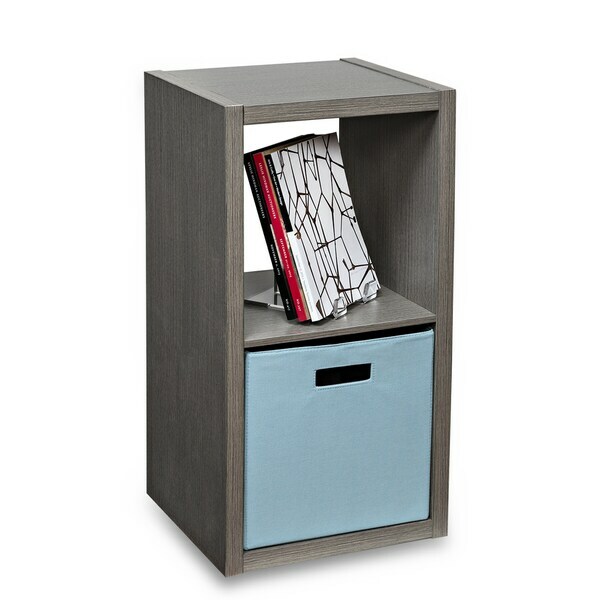 Our 2-cube organizer is a stylish way to add extra storage space to any room. It can hold two 13" cubes and be displayed horizontally or vertically. The contemporary, weathered teak finish complements most home décor while providing a subtle hint of color. This versatile unit is perfect for a living room, office, children's room or mud room. When paired with storage cubes or baskets, it can accommodate even the smallest of items. Also available in 3-cube, 4-cube, 6-cube and 9-cube styles. I really wanted to like this organizer. The color is really pretty, however it is quite cheap. It had many scuffs coming out of the box. It had stickers to cover over screw nails! It is fine for what I needed it for but I would definitely not buy a second one!